Moon tattoos are perfect for anyone who believes in the powers and influence of celestial powers, has a whimsical side, or appreciates the history and science of astronomy. Moons are deeply symbolic images on their own, but their meaning can increase when paired with another symbol, such as a sun or a wolf; such paired and multifaceted designs will also be discussed below. Moons are also a great tattoo to get if you want a small and discreet tattoo, though they can easily be adapted to fit a larger space, either on their own or as part of a scene. 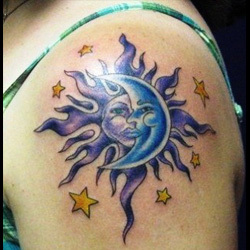 There are several different variations possible when considering a moon tattoo design. As the moon waxes and wanes over the course of the lunar cycle, your first choice might be to decide which phase you want your moon to be in. From there, you can consider how you want your moon to be depicted, or if you want other symbols or elements added to the moon. Getting a half moon tattoo, is a great way to demonstrate the duality of your own nature, or of life in general. The half, or crescent, moon occurs when the moon is waxing (going towards its full moon phase) or waning (going towards its new moon phase). Having a crescent moon tattoo, therefore, can symbolize a couple of different things: if the moon is in its waning crescent phase, it symbolizes the expulsion of negative energy from your personal, spiritual, or work life: you are ridding yourself of the people, habits, or things that you no longer need or which are harmful to you. If it is in its waxing crescent phase, however, it symbolizes growth and creativity. The crescent moon's small shape makes it the perfect tattoo for a delicate placement inside the wrist, on the ankle, or behind an ear. The most simple design is the crescent moon itself, either outlined in black or completely filled in. If you want to be a bit more creative and personal, however, you can design the moon so that it's made up of other shapes or symbols, such as stars or butterflies, for an especially feminine touch. While we often envision the moon as white or yellow, using these other symbols to make up the moon is a great way to add some color to your design, such as vibrant blues, purples, and pinks. You can also give your tattoo a bit more personality by including a facial profile in the half moon. This can create a sense of whimsy, and personify the moon to represent your own beliefs in the moon's powers and purpose. As the moon is commonly associated with the feminine, you may wish to make your moon female, with a caring or nurturing disposition. The moon is also associated with lunacy ('luna' being the Latin word for moon), and depicting your moon as crazed or wild can inject this meaning into your tattoo. Several superstitions have arisen in relation to the full moon: it is a time when the celestial pull on the earth is especially strong, and we feel the power of the heavenly bodies above. A full moon is especially associated with insanity, change, and a time when boundaries between this world and the next are somewhat relaxed and fluid. A full moon tattoo can be designed in several different ways to depict any one, or several, of these meanings. One possible design is to make the moon realistic, complete with craters, the Sea of Tranquility, and other geographic landmarks. This is an especially good tattoo for someone with an interest in astronomy, or even American history: for instance, why not put an American flag on the moon to commemorate the first man on the moon? Another option for the full moon tattoo is to embrace its gothic and otherworldly connotations. The full moon is traditionally associated with the time when werewolves would transform and when witches and warlocks would cast especially powerful spells. Having a full moon tattoo is thus an especially powerful symbol for practitioners of Wicca, or for those who believe in these beings. Incorporate your beliefs by including a witch flying across the moon, or by including a cauldron or black cat underneath the moon. If its more general gothic symbolism you'd like to focus on in your full moon tattoo, have some eerie, wispy clouds floating across the face of the moon, or have the moon be a backdrop to a raven, a harbinger of death, on a branch. As seen with some of the full moon symbolism discussed above, there are times when the moon can become a dark, even evil, symbol. You can build upon this imagery in your own moon tattoo by incorporating a particularly nasty face onto a full or crescent moon. For instance, on a crescent moon design you may wish to have a snarled lip, bared teeth, or scowling eyes shown in profile, perhaps directed at a particular person or thing, also included in your design. For a full moon design, you can incorporate the same scowling or ominous look for the moon's face, but this time directed outward at anyone looking at your tattoo: they will therefore be warned of your own dark, potentially evil ways, and know not to cross you! We've all heard the saying that something particularly rare only happens "once in a blue moon". 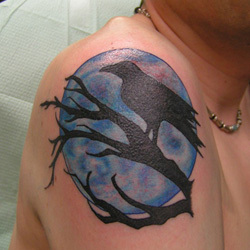 Getting a blue moon tattoo, therefore, can indicate the occurrence of a rare event or celebrate a personal accomplishment. 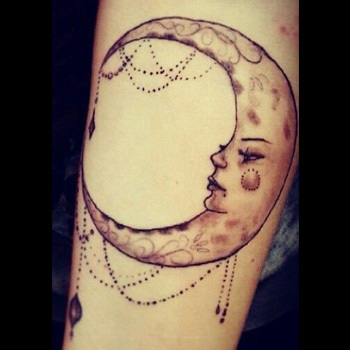 There are a few ways that this design can be accomplished, whether you're getting a full or crescent moon tattooed. The first option is to have the moon literally blue, with the best options for color being a royal or cobalt blue. Another design option is to have the moon stay the traditional white or glowing yellow color with a blue aura or mist surrounding it. As with other moon tattoos discussed here, you can also incorporate different symbols or elements into the tattoo to further personalize it or enhance its meaning: for instance, a black cat could add to a more gothic interpretation of the moon, while a set of stars could serve as a reminder of loved ones passed away. Getting a half sun/half moon tattoo is an excellent way to express your own duality, and the duality of nature. While the moon represents our lunar traits, such as potential beneath the surface, our emotions, and intuition, the sun represents our solar traits, such as our reason, ego, and leadership potential. We all have certain lunar and solar traits, and therefore this tattoo is a great way to represent that beautiful balance within ourselves. Depending on how you feel about this balance of traits, there are a few different design choices you should consider when getting your sun/moon tattoo. If you believe that your personality demonstrates a harmony of these traits, you may want to get the sun and moon facing each other, with their faces reflecting peacefulness or contentedness. If you feel an inner struggle or tension because of this duality, however, you may want to have the sun and moon each facing outward, or even pulling away from each other. Whichever option you choose, you will want to differentiate between the sun and moon in terms of color and even shape. One popular design choice is to have the sun a traditional yellow, representing those active and vibrant solar qualities, while the moon is a more pensive blue color, representing the more subdued, lunar qualities. You may also want to include rays around the sun half and stars around the moon half to further differentiate between these two celestial bodies. While the moon is already a powerful symbol in and of itself, adding a wolf to your moon tattoo creates an even deeper meaning. 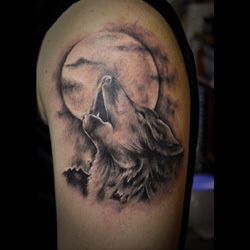 The wolf has particular prominence in Native American culture and environmental circles, thus making a wolf and moon tattoo especially great if you are a member of a Native American tribe, have an affinity for Native American culture, or have a deep respect for nature. One popular design choice for the wolf and moon tattoo is to have the wolf howling at the moon. The wolf is an incredibly intelligent animal that can communicate with its brethren from all over a particular region simply by howling to call a meeting. Thus, this image is an excellent choice for those who believes themselves to be particularly communicative, or who are leaders of a pack. In Native American culture, the wolf is also the totem of the afterlife. By combining this animal with an image of the moon, therefore, one can doubly link this image to that of the world beyond. In this design, the wolf need not be howling, but can simply be beneath the moon, or in the foreground of the image. The wolf is not an animal to be feared in this scenario, and it is therefore best for its face to reflect a pensive, even helpful, disposition. In many cultures, cats are incredibly symbolic animals: this is especially true in Western culture, where cats (especially black cats) are believed to be the familiars of witches and thereby potentially evil, and ancient Roman culture, in which cats were associated with the moon goddess Diana. In both of these popular depictions, cats are also affiliated with the moon, thereby making a cat and moon tattoo a particularly great tattoo. 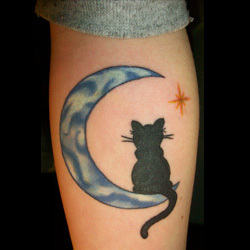 Depending on which cat and moon association you wish to depict, your tattoo design will vary. If you like the aura of mystery and power, including the power to do harm, that the black cat of witchcraft conjures, then you may wish to have your cat be seated beneath a full moon, its eyes aglow, with perhaps a witch flying across the face on the moon on her broomstick. If you prefer the association of the cat with Diana, however, or if you just want to include a cat image in your tattoo, there are even more design options. To demonstrate the cat's connection with the moon, you may wish to have the cat sitting on a crescent moon, showing the affinity between the two. You can even choose to have the moon smiling at the cat, or the cat and moon sharing a glance. In these design options, the color and breed of the cat can be anything your heart desires: perhaps you want to even represent your own pet in the design! Some of the most important connotations of the moon are of feminine mystique and power, and incorporating a fairy into your moon tattoo will further intensify this symbolism. The fairy can be a symbol of both mischief and innocence, obedience and defiance, thus taking on many of the contradictory nature of woman herself. 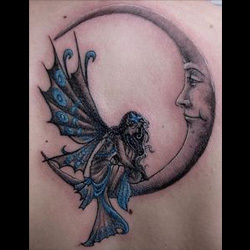 Depending on the quality or qualities that you want your fairy and moon tattoo to represent, there are several different design possibilities you can consider. One of the most popular and easily personalized designs is of a fairy sitting on a crescent moon. If you choose to include a face on your moon then you can have your fairy and moon looking at one another, sharing a communion of spirits or with nature, or you can have the fairy facing away from the moon's face, perhaps in a petulant huff after getting in trouble for mischief making. Another design choice is to have the fairy fluttering around the moon, perhaps showing off its wings or simply expressing its pixie spirit. 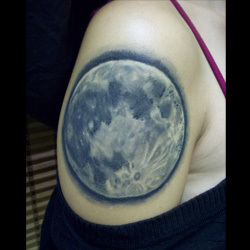 For this tattoo design, you can choose to give the moon a face or to keep it plain or realistic. The focus here is on the fairy, so let its personality shine through! Whichever way you choose to design this tattoo, the fairy element allows you to be incredibly creative with your color, size, and other design choices. The fairy might be sad and pensive, happy and excited, or mischievous and cunning: whatever the case, the colors of its body, hair, and wings are exclusively up to you, meaning that there are almost limitless possibilities to how you can personalize this design. 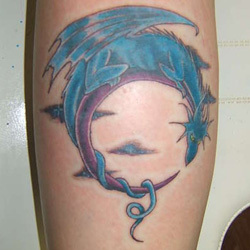 As with many of the other design choices discussed above, including another element, in this case a dragon, will have a profound impact on the meaning of your tattoo. For instance, in Chinese culture the dragon is a potent symbol of power and good fortune; thus, when combined with the moon, this image becomes doubly symbolic, also standing for the growing power of the waxing moon or the potentially supernatural power of the full moon. There are several popular dragon and moon designs to choose from, or you can make up your own! One great design that can be customized to suit your own personal preferences, is for the dragon to be encircling a crescent moon so that it follows the moon's shape and almost covers it completely. In this design, you can customize the dragon's color and facial expression to suit your exact preferences: it can be a whimsical or friendly dragon with scales in vibrant blues and purples, or it can be a fearsome and antagonistic dragon with blazing eyes and steam coming from its nostrils. Another option, which is equally customizable, is for the dragon to be flying across a full moon. As the moon is at its most powerful when it is full, adding a dragon, another powerful image, makes this symbol even more potent and awe-inspiring. For a simple tattoo, have a black dragon flying across a white or yellow moon, or further personalize it by customizing the dragon's color and expression. While the more simple design can easily fit almost anywhere on the body, a larger image of a dragon flying across a full moon is best done across the back or on a bicep. Including other celestial bodies, such as the sun and stars, in a moon tattoo will give you the freedom to further personalize your moon tattoo design in a variety of ways. The sun, moon, and stars are all complementary images that reside together in the sky, and the meaning behind these combinations is rich and varied. Including the both sun and stars in your moon tattoo is a great way to fully encompass the powers of these various celestial bodies, or to represent different people or elements that are important in your life. As the sun is traditionally associated with more masculine traits and the moon with more feminine traits, you may wish to ascribe the facial features of your mother and father, or yourself and your partner, onto the sun and moon. The stars, in this design, can be representative of you and your siblings, or your children. Another design option for including the sun, moon, and stars in a tattoo is to be realistic in your depiction of lunar and solar geography and of star placement: this is a great choice for anyone with a scientific interest in astronomy! You can further personalize this design by having the stars form a particular constellation, perhaps one that's of interest to you or designates your Zodiac sign, or by having the sun, moon, and stars in the position they were in when you, or someone close to you, was born. 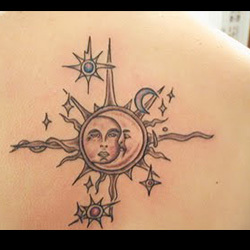 As discussed above, the dual natures of the sun and moon are often expressed in a half-sun/half-moon tattoo. But this is not the only design option for these two symbols! You can also design your tattoo to be of a full moon and sun, thereby demonstrating that you have harnessed the full power of both these elements. In this design choice, you can personalize the sun and moon through personifying them with faces, or by playing with color choices. You can also choose to represent more realistic depictions of the sun and moon, especially if you are an astronomer or have a fascination with the solar system. In either design choice, it's a great idea to put the sun and moon on opposite sides of your body (such as one on the inside of each wrist, behind each ear, or on each shoulder) to demonstrate their opposite traits. Surrounding the moon with stars in your tattoo design creates a beautiful vision of the night sky, and also creates a very personal tattoo. 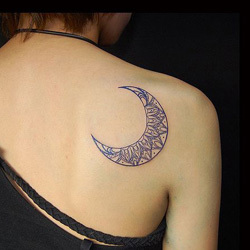 If you like the tribal style of tattoo, you can work with your tattoo artist to design the moon in the classic block, black shapes of tribal artwork, and surround the tribal moon with either tribal or regular stars. This design can also be adapted by using Celtic artwork for the moon and/or stars, creating a beautifully interlocking design. To further personalize this tattoo design, you can have the stars make up your favorite constellation or your Zodiac sign, or the stars can be representative of loved ones you have lost. In this case, you can also include the birthdates or names of your loved ones, or have a meaningful quote situated beneath the design. There are several different ways to personalize your moon tattoo: from personifying the moon to adding complementary images that further its symbolic meaning, your moon tattoo will be able to represent the exact meaning you wish to inscribe on it. There are also a wide variety of placement options for moon tattoos, so your design can easily fit almost anywhere you want it to! 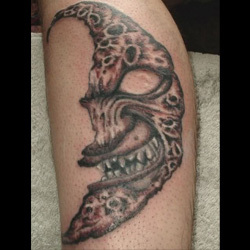 For custom design of a Moon, you can check our Custom Tattoo Page.